Walking into Disotto is like being transported to another place and time. The dining room is rich with stone, brick and wood, while the aroma of pomodoro sauce and fresh pasta permeates throughout. This Italian wine bar features regional cuisine in a rustic and casual setting. When you walk in the door, you instantly are swept away to Italy and welcomed as if you are in a friend’s home. Disotto offers modern regional Italian cuisine featuring handmade pastas and grilled pizzas. It’s obvious the chefs take pride in sourcing the best ingredients and preparing them simply. One of Disotto’s signature pasta dishes is Pappardelle with Sal’s Bolognese, herbs and parmesan. Others rave about the Brussels sprouts with farm egg, crispy prosciutto, Calabrian chilies and pecorino. Be sure to save room for one of the delectable Italian-inspired desserts, including Phil’s Cannoli with a citrus-ricotta filling, shaved chocolate, pistachio and amarena cherries or the Torta Bacio, a chocolate-hazelnut mousse with a white chocolate center and a crunchy bottom. Disotto is located at 310 Green Bay Road in Highwood, 224-765-9490, www.disottoitalian.com. 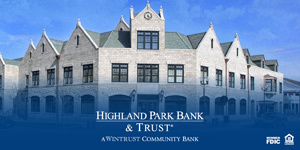 Highland Park Today is published in collaboration with the Highland Park Chamber of Commerce. © 2016 Bohringer Creative, Inc.